Back in 1956, when the Benelux countries joined forces with West Germany, France and Italy to form the European Coal and Steel Community, no one could have foreseen that this organisation involving six nations would today have grown into the European Community. 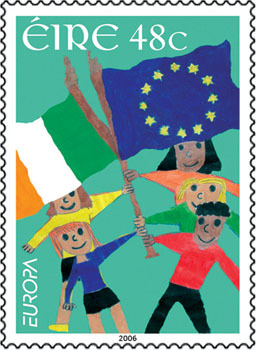 The six countries released stamps in a common design showing a giant E covered with scaffolding while the word EUROPA also featured prominently. Like the concept of a European Community would grow out of all recognition, so too the Europa theme has grown considerably as well as changing its character. 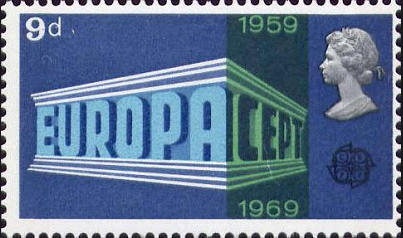 Annual issues by the original six members continued until 1959, but the following year the Europa concept was taken over by the Conference of European Posts and Telecommunications administrations (CEPT) and from then onwards stamps inscribed EUROPA often incorporated the four interlocking posthorns emblem as well. CEPT embraced the countries of Europe from Ireland to Turkey, broadly covering those which were not in the Communist bloc. Significantly Yugoslavia, which had broken away from the others, belonged to CEPT and issued Europa stamps each year. 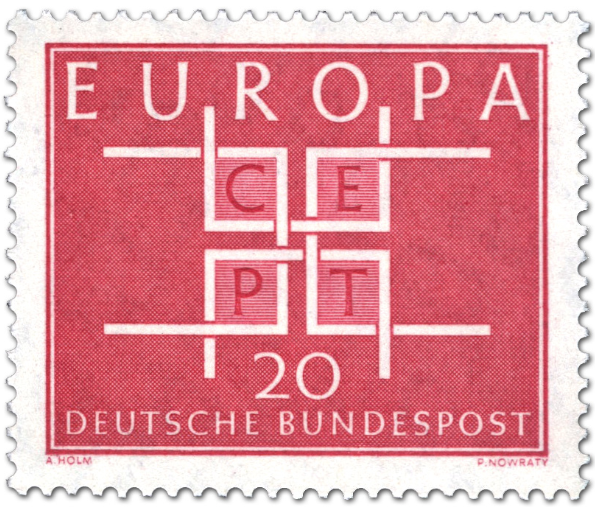 Conversely, the UK, a member of CEPT from the outset, only issued Europa stamps in 1960 and 1961, and did not return to the fold until 1980. 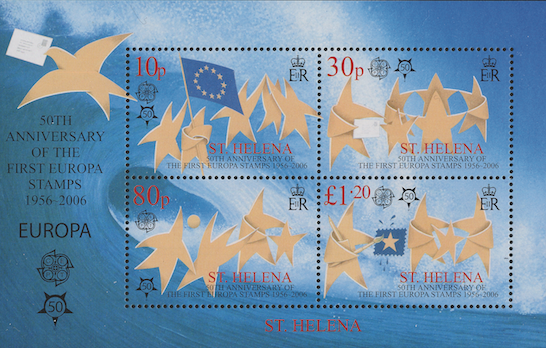 Whereas most member countries issue a set specifically for Europa, Britain has been rather half-hearted and only occasionally includes a stamp design based on the annual Europa theme. 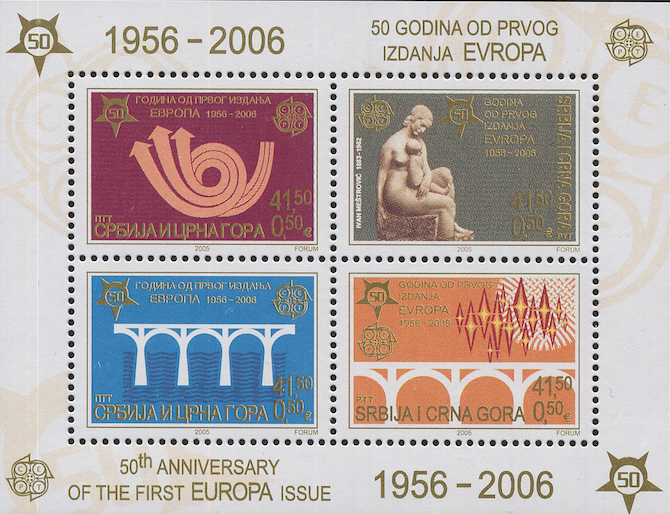 In the early period the annual Europa stamps generally conformed to a standard design, although it might be open to local modification and interpreted by different printing processes. This meant that symbols of unity and solidarity were used, often alluding to the member countries quite ingeniously, such as the wheel with 19 spokes, the dove of 19 little doves, the flower with 19 petals or the chain with 19 links. This was all well and good, but rather dull and as a result CEPT decided that, from 1974 onwards, the annual issues with have a common theme, leaving it to individual postal administrations to decide how they wished to interpret it. As a result there appeared annual issues featuring the applied and decorative arts, music, famous women, scenery, historic personalities, folklore, technology, children’s games, the European contribution to space exploration, tales and legends, festivals, parks and gardens, culinary dishes, circus, posters and tourism. Aspects of the postal services were not overlooked, being the subject of the series in 1979 as well as featuring in the 1988 series devoted to transport and communications. Conversely, on two occasions CEPT reverted to uniform designs – in 1984 when the bridge motif by Jacky Larriviere was used to celebrate the 15th anniversary of CEPT, and in 2000 when the Millennium was marked by the design by Jean-Paul Cousin showing building blocks and European stars. By the end of the 20th century the organisation now known as PostEurop had expanded and today the announcement of the annual theme is highly anticipated by thematic collectors, with countries each adding their own take on the subject, some more creative than others. Read about and see the latest Europa stamps in every issue of Stamp Collector magazine. Read our guest blog on 2018's Europa stamps on the theme of 'Bridges'.